Darryl F. Zanuck's original plan was to borrow MGM's Clark Gable to play Dion O'Leary, the part played by Tyrone Power. 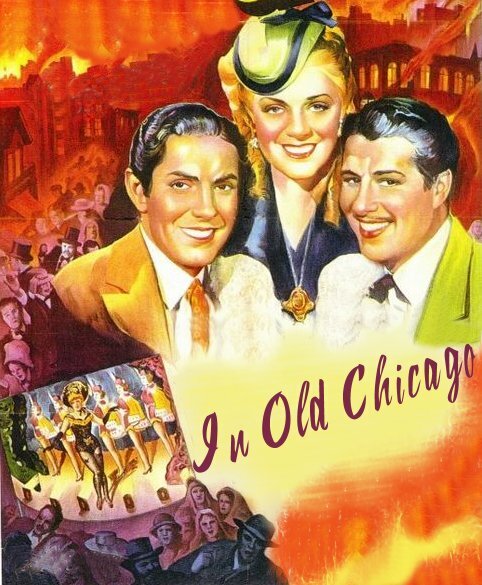 Henry King, the director for In Old Chicago, however, was not satisfied that Gable would be right for the part. King commented, 1, "I finally convinced Darryl F. Zanuck that Gable was too old for the part and would not be believable as the repentant Dion at the climax. Power's portrayal was one of the prime elements in In Old Chicago." Jean Harlow was cast as the female lead. She died just before the filming, however. Ty pushed to have his good friend, Alice Faye, take the role of Belle Fawcett. To help her win the role, he auditioned with her, doing the scene where she tosses all kinds of objects at him as he enters the room. So zealous was she in her acting that she accidentally hit him in the head, almost knocking him out. 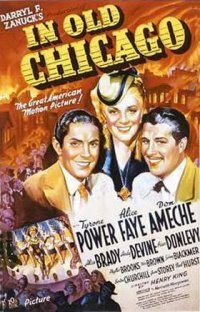 The "burning of Chicago" cost $150,000, and the Fox back lot burned for three days. The story was a fictionalized account of the O'Learys, who owned the cow that started the fire. Don Ameche played Ty's brother in the film. He and Ty were very good friends off screen. Don was Ty's best man when he married Annabella in 1939. Tom Brown played Ty's younger brother. Years before, in Ty's very first film, Tom Brown had played the lead role in Tom Brown of Culver, while Ty had only a bit part. How fortunes had reversed for these two! Variety "Pic is big and it is showy, but it is historically cockeyed in the placement of its main characters...but as a film entertainment, it is socko." New York Herald Tribune Superb screen spectacle has been coupled with enough pieces of historical reconstruction in Darryl F. Zanuck's production. Fine acting by Alice Brady and Tyrone Power. They have the skill to personify a dramatic place and a dramatic time in their characterizations, and thereby hold the random elements of the offering in balance." The New York Times "Troy was a bonfire, Rome a false alarm, compared with Mr. Darryl Zanuck's In Old Chicago, a four-alarm picture." 1Belafonte, Dennis, The Films of Tyrone Power, The Citadel Press, Secaucus, N.Y.